To burn fat, you need a smart, nutrient-dense diet and a workout program that’s packed with exercises that target as many muscle groups as possible. You’ll find five of those exercises—picked by a handful of the nation’s top trainers—on this page. So step away from the treadmill, weave these metabolic super-moves to your workout rotation, and watch the fat melt away. “Squatting and pressing are both moves that belong in everyone’s workout,” says Rachel Cosgrove, 2012 IDEA Personal Trainer of the Year and author of The Female Body Breakthrough. The squat to press combines them into a single move, hammering your legs, shoulders, and every muscle in between. 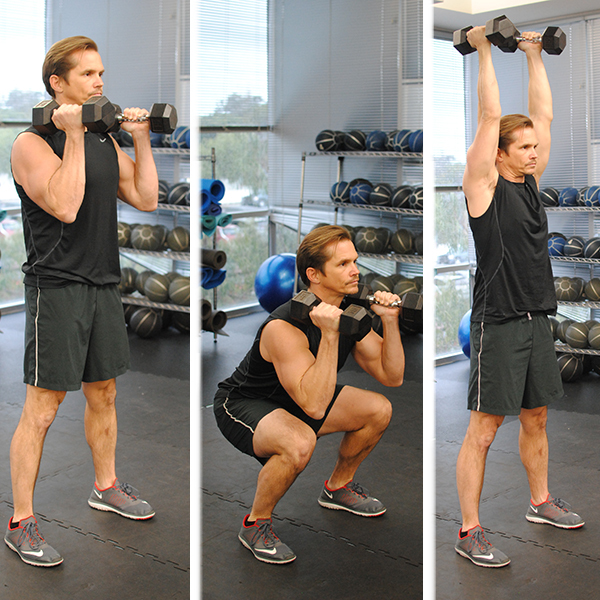 Directions: Hold a pair of dumbbells next to your shoulders and stand with your feet shoulder-width apart. Keeping your back flat, push your hips back and squat down until the tops of your thighs are at least parallel to the floor. Pause, then drive through your heels as you stand up and press the weights straight above your shoulders. Lower the weights to return to the starting position. Do three to four sets of eight to 12 reps.
“Don’t underestimate the value of moving around on the floor for burning fat,” says powerlifter David Dellanave, owner of The Movement Minneapolis, in the Twin Cities. “The sit-through is surprisingly taxing—you’re supporting your entire bodyweight on all-fours and then moving through a wide range of motion while synchronizing the actions of multiple limbs and muscles.” In short, it taxes your body and challenges every aspect of athleticism: Mobility, strength, power, and coordination. Directions: Assume a bear crawl position with your back flat and the balls of your feet and palms of your hands on the floor. In one movement, pivot your right foot, reach your right arm above your head, rotate your chest toward the ceiling, and slide your left foot underneath your body until it’s flat on the floor. You should now be sitting with your left leg extended and your right leg bent. Raise your hips, and reverse the movement to return to the starting position. That’s 1 rep. Repeat to your other side. Continue to alternate sides with each rep. Do 3 sets of 10 reps. 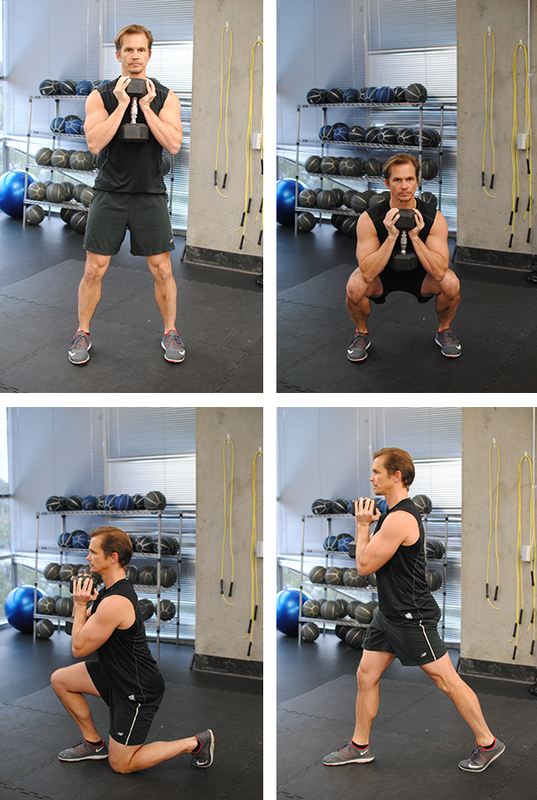 This innovative squat-lunge hybrid combines one of the best lower-body moves you can do, the squat, with a rotational element that nails your core. “It’s a killer exercise,” says Dellanave. “You get tremendous time under tension, a huge range of motion, and some good mobility work—especially in your hips.” says Dellanave. “It’s a killer exercise.” And its fat loss dividends are worth every drop of sweat equity. Directions: Grab a dumbbell and hold it vertically in front of your chest, cupping the top end with both hands (imagine it’s a heavy goblet). Set your feet shoulder-width apart. Keeping your back flat, push your hips back and lower your body until your hips drop below knee-level. Rotate to your right, dropping your left knee to the floor, and then stand up. Reverse the move, lowering your body, rotating back to center, and then standing up. That’s one rep. Repeat the entire sequence, this time rotating to your left and dropping your right knee to the floor. Continue alternating sides. Do 3 sets of 10 reps.
“In the hierarchy of fat loss, resistance training comes right after nutrition, as it has the largest impact on metabolism,” says Craig Rasmussen, C.S.C.S., a trainer at Results Fitness in Santa Clarita, California. 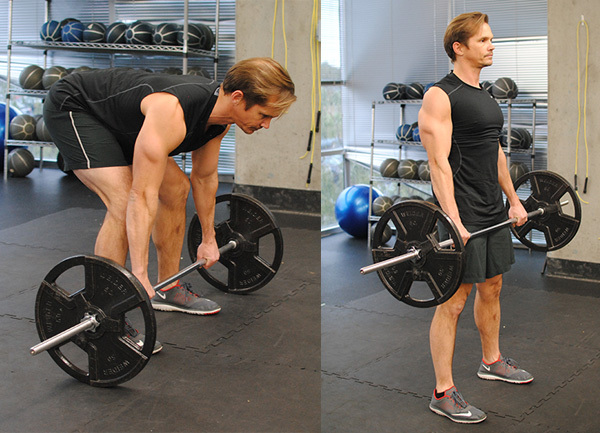 And no exercise works more “metabolically active tissue” (AKA muscle) than the deadlift, which targets your glutes, hamstrings, quads, core, back, and shoulders. “It’s a true total body exercise, which is exactly what you need when training for fat loss,” says Rasmussen. Directions: Load a barbell with moderately-heavy to heavy weights and roll it against your shins. Keeping your back flat, push your hips backward, bend your knees slightly, and grab the bar using an overhand grip with your hands just beyond shoulder-width. Drive through your heels, pulling your torso back and up and thrusting your hips forward as you stand up with the bar. Pause, and then slowly lower the bar back to the floor, keeping it as close to your body as you can. Do three sets of 8 to 10 reps. Directions: Head to the track at your local high school or university. If you’re already fit, run 400 meters (one lap) as fast as you can, and then walk 200 meters. If you’re just starting out, run 200 meters (half a lap) as fast as you can, and then walk 200 meters. Either way, that’s one interval. Do four to eight. Don’t have access to a track? 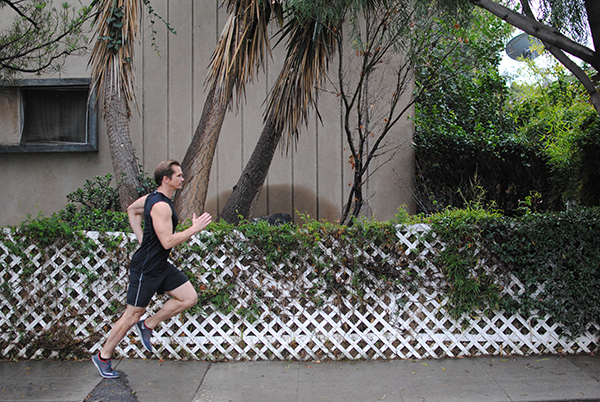 No worries—perform the workout on a smooth even trail, sidewalk, or beach, and measure each interval by time instead of distance. Sprint for 20 to 60 seconds (depending on our fitness level), and then walk for an equal amount of time to complete one interval. Mizuno Running Shoes? Heck yeah!